If motocross is in your blood and you want to become a better rider, this is the right place for you! Greg "Frenchie" Pamart is a life long racer. 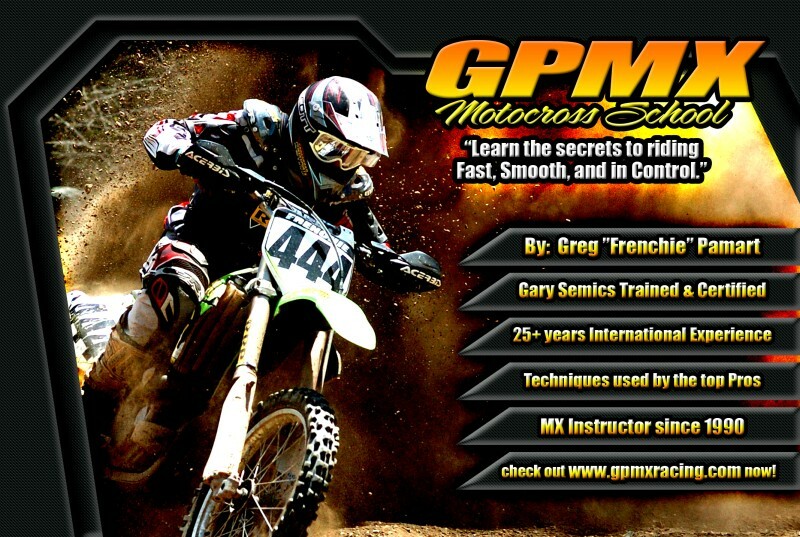 Frenchie has been a Motocross instructor since the early 90's and has been teaching in the US for over 10 years. He started at his local motorcycle club in France, graduated from the chalenging FIM "educator Sportif" program in 1994 and he is today one the very few Franchise "Gary Semics Instructor" (one of the best instructor in the world). The Gary Semics school trained riders like Jeremy McGrath, Ryan Vilopoto, Steve Lamson, Ezra Lusk, Kevin Windham, Stephane Roncada, John Dowd, Branden Jesseman and many other top pros, plus hundreds of beginners and amateurs every year. You should try it too! We are based in Eastern PA and travel all over the East coast for MX school and races. Check out the different option that we offer, From hourly session to full season support! Go to the schedule, pick an open date or sign up for an existing school and lets get started!